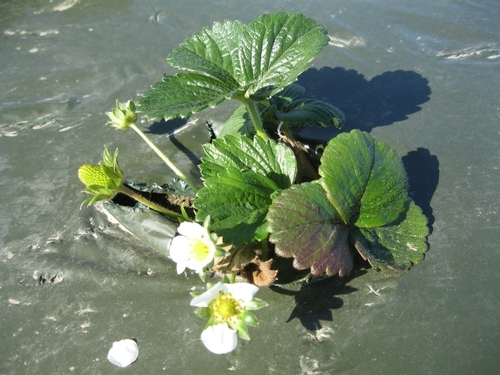 The combination of 1,3 dichloropropene (1,3-D)and cholorpicrin is a popular choice for fumigating strawberry fields after methyl bromide. It is very effective and convenient to administer through the drip irrigation system. 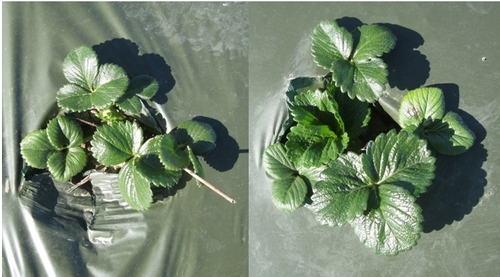 However, 1,3-D can result in phytotoxicity if transplanting takes place before the fumigant completely dissipates. Symptoms of phytotoxicity from 1,3-D include yellowing of leaves purple coloration and stunted plant growth. 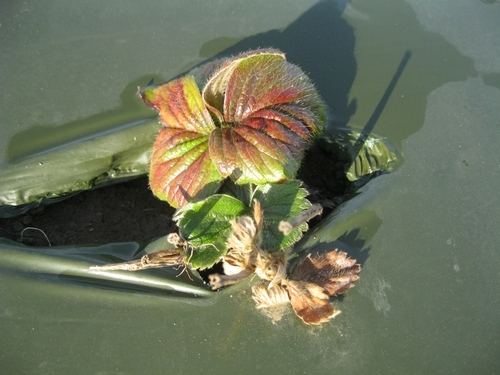 Newly emerged leaves will look normal and plants appear to recover to some extent, but subsequent growth and yield potential can be affected. Proper planting interval after fumigation is very important to avoid phytotoxicity and subsequent crop losses. It usually takes two or more weeks for the fumigant to dissipate depending on the type of soil, method of application, plastic mulch, and soil temperature and moisture conditions. Use of virtually impermeable film (VIF) or totally impermeable film (VIF) increase the effectiveness of fumigation, but retain the fumigant for a longer period in the soil requiring additional time before planting. Chloropicrin and 1,3-D usually are ideal for dryer soils and require longer planting interval in moist soils. In drip fumigation, adequate amount of water to apply fumigants is important. Excessive water can dilute the fumigant concentration and reduce its effectiveness. Insufficient water limits the distribution and may increase the volatilization of the fumigant and thus reduces its effectiveness. A minimum of three weeks of plant-back time is recommended for drip applied 1,3-D products. It is important to refer to the product label for proper fumigation procedures and planting interval. 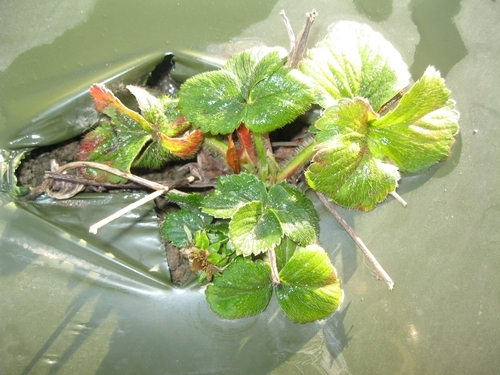 A healthy start is essential for the season long performance of the strawberry plant and realizing the maximum yield potential. Santos, B. M. 2007. Life after methyl bromide: research on 1,3-dichloropropene plus chloropicrin in Florida. University of Florida Cooperative Extension Service publication HS1119.